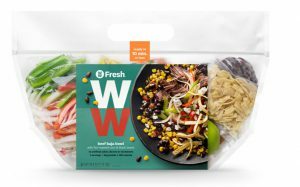 NEW YORK /PRNewswire/ — WW (Weight Watchers reimagined) today introduces new WW Fresh quick-prep meals, which are chef-inspired, nutritionist-approved and ready-to-eat in 10 minutes or less, currently rolling out at more than 200 Hy-Vee grocery store locations across the Midwest. WW Fresh meals serve two people and range in price from $14 to $20. With all ingredients pre-prepped and proteins pre-cooked, meals are ready in three simple steps: combine, heat, and enjoy. WW Fresh quick-prep meals were developed in collaboration with fresh food industry innovator, FreshRealm, and are backed by the WW Freestyle program, which is proven to help you lose weight, sleep more, and feel happier. Alongside a new partnership with Blue Apron to deliver Freestyle meal experiences directly to people’s homes, the WW Fresh meals give consumers looking to maintain a healthier lifestyle access to delicious and convenient options at grocery; both products are components of the WW Healthy Kitchen portfolio, designed to make healthy cooking and eating much simpler, easier, and joyful for all. To read Director of Media Development Greg Johnson’s column on produce in WW diets, click here.